Is now safe in the arms of Jesus. The battle is over and the victory won. The recent past: Perhaps you read our recent report and prayer request for Rich (Max) McIntyre who suffered from a cancer tumor growing in his esophagus. He was in a lot of pain and misery and decided to refuse the feeding tube. Rich was a graduate of Pensacola Bible Institute. He was used of God as a fearless street preacher and had a tour of service in China teaching under severe conditions. Rich was used of God to lead many folks to Christ, and he had a down home way of cutting to the heart of a need in Christian friends and inspiring zeal in them. The cancer situation Rich suffered had a very low survival rate, so we prayed knowing God might take Rich Home. Rich preferred to go Home to Jesus quickly than to die a long drawn out death, so he chose to go on a fast. Rich's sister reported that in the last few days Rich raised his hands to the Lord several times and shouted "Jesus Christ is Lord!" At one point he also said with disgust, "Stupid Jehovah's Witnesses." Now friend, if you are a Jehovah's Witness, that ought to make you pause to consider. A man's last zeal is not a light thing to cast aside. Latest: Apr. 27-- We were all told that it would be just a few days until Rich went to be with Jesus. Rich and his friends had already planned his funeral to be a great preaching service with lots of good music and Gospel preaching. One of Rich's good friends expressed frustration and pain of soul to have to consider losing his old friend in the battle for souls. Rich lead this friend and his wife to Christ long ago. Those who have been at the bedside of one in such pain and struggle will know what Rich went through. Pray for John McIntyre, Rich's Dad. He has had to watch his wife, and now his only son, die slowly of cancer, and John is having a hard time, as is Rich's only sister, who is now left as her father's only living child. Rich led both his father and sister to Christ. His sister is married and has two children. His mother was saved and having gone on so long ago, is rejoicing to look upon her son's face again. Rich asked that the bagpipes be played at his funeral-- Gospel hymns in old time Scottish zeal. Rich played the bagpipes as part of his street preaching ministry. Also, Rich arranged that the Gospel of Jesus Christ be preached with fire and passion. Pray that those who attended, who are not born again, will be gathered into Christ as one last tribute to Rich's zeal for Christ. 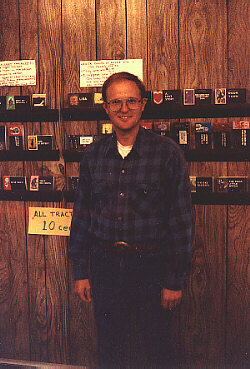 The photo above shows Rich standing in front of the tract rack at the church pastored by this editor in Grant, Michigan. fondly known as "Max" by friends, is in The Glory. We all know that don't we. God cannot allow any sin into His heaven, so you and I have to get cleaned up NOW. Can we do that ourselves? Some churches teach that you can get clean be working at it. Is that possible? We cannot do enough good things to please God and cause Him to forget our sin. Sin has to be PAID for like a fine at the court house. We have no way to pay the fine for our sin, so Jesus did this for us. If we refuse to accept the payment in full by Jesus, then we have no hope of salvation. Did you ever wonder why Christians make such a fuss over the death and resurrection of Jesus Christ? Well, that is how Jesus paid for our sins. What love and selflessness our God and Savior Jesus Christ showed to come and die for all sin, yours and mine and everyone's. Will you accept that payment for your sins? Do you believe this is the ONLY way you can "get right" with God? If so, you are on the steps of eternal life. Only one thing remains for you to do. ONE: Tell God out loud that you are a sinner and that you believe Jesus is the only hope you have to eternal life. TWO: With all the faith God has given you, and that may not be much-- Still, believe what you know is true, and thank God for saving you from sin and hell. THREE: Tell someone you know is a born again Christian that you have confessed your faith in Jesus Christ. I would also be delighted to hear of your new faith and encourage you in any way I can. 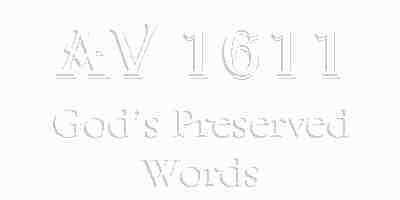 Verse 11 above says that you will never again be ashamed as you consider how God may look on your life. I think that is the single most blessed promise in the Bible-- Never ashamed again. If you were not sure if this was what you needed as you read the above, is this your problem-- shame? Have you wasted a lot of cash on shrinks trying to sublimate sin, and it won't go away? Come to God through Jesus Christ, and the shame and guilt will all be lifted-- forever. Why not read through the above again and take care of the sin and guilt NOW? There is no debt left to pay for your sin-- Jesus paid it all. God bless you as you start your walk with Jesus Christ, the very same walk Rich McIntyre showed us by example. My, my, but there is no telling what mighty things God now has in store for you. If you were a close friend of Rich McIntyre, and you would like to add a memory about Rich, send it by E-Mail, and we would be pleased to add it to this page. And it sure makes the devil crawl.